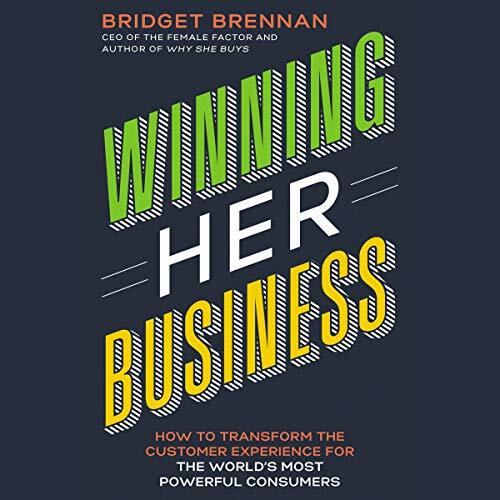 Bridget Brennan, CEO of Female Factor, shows listeners how to win sales and grow market share by creating a customer experience that appeals to the most powerful consumers: women. When people think about the world’s growth markets, they often envision countries like China and India. Yet they miss the largest one right here at home, no matter where you call home: women. With women driving 70 to 80 percent of consumer spending, it would seem an obvious strategy to learn how best to appeal to this continually expanding market. Common sense? Yes. Common practice? No. Showcasing best practices from brands as diverse as Lexus, Sephora, Allstate, and the Minnesota Vikings NFL team, Winning Her Business offers invaluable insights into women as consumers and shows that almost all businesses have an opportunity to create an inclusive customer experience that inspires increased sales, referrals, and repeat business. Charts and discussion questions in the audiobook companion PDF download. Brennan's four motivators model for selling to women is straight-forward and memorable. The model provides a helpful checklist that I now keep in mind when working with my female clients (and a lot of this applies to my male clients as well). However, what I found really helpful was the numerous practical and actionable tips for each of the four motivators that were brought to life with relevant real world examples.